After years of short-term extensions, the fate of the EB-5 investor visa program is still unknown among local and national experts, but most agree that dramatic changes to the program are more likely than expiration. The EB-5 immigrant investor visa program was designed to create jobs and spur national economic development by incentivizing foreign investment in commercial enterprises in return for a Green Card. To participate in the program, investors must have a minimum investment of $1 million, or $500,000 in areas with high levels of unemployment – at least 150% above the national unemployment average. The future of the program is uncertain, as Congress has had trouble passing a long-term extension, and continue pushing back the expiration date. On Sept. 30, Congress yet again delayed the expiration to Dec. 8, and local and national experts are unsure what’s up next for the program. “It’s a huge toss-up in Congress,” said Mikki Canton, managing director of the City of Miami EB-5 Regional Center, the only municipally run regional center in the nation. “We have been waiting on it, extension after extension, and there is a sense of exhaustion and inevitability,” Ms. Canton said. Though the continued short-term delays are designed to buy Congress more time to draft reforms, most people believe Dec. 8 will bring another short-term extension. “The Senate and the House will most likely incorporate the extension of the program into whichever appropriations bill is happening at the time,” said David North, a senior fellow at the Center for Immigration Studies, a Washington think-tank. Critics of the program say there needs to be additional transparency, a higher investment requirement and more regulations. Though many people believe the program has gotten out of control, Ms. Canton said more regulation can help get it back on track. “We’ll see more integrity measures in legislation and a great deal of oversight and due diligence,” Ms. Canton predicted. Though developers do not favor regulations, Ms. Canton said she believes it could reconnect the program with its original intent to drive economic growth in underserved areas. The Targeted Unemployment Areas (TEA) that reduce the minimum investment are not regulated nationally, and many critics of the program say developers are gerrymandering to take advantage of the EB-5 investment money and avoid directly investing in impoverished communities. “The TEA concept is being studied more carefully to create one standard for every project, rather than states using census tracts” to connect economically diverse areas, Ms. Canton said. The program also has moral objections, as many believe that the US shouldn’t be selling visas to benefit already-rich developers. If the program expires come December, nobody is certain about how it would play out. Though Mr. North said he believes an end to the program would not hurt developers, Ms. Canton says they are the only party at risk if the program expires. Though roughly 80% of immigrants entering the US using EB-5 visas are Chinese nationals, Mr. Montero said that South Florida industry is unique. “The overwhelming percentage of investors in our market represent Latin America,” he said. Miami’s market departs even farther from the national market in the operation of its regional center. Miami has one of the only publicly run regional centers in the US, and it can designate EB-5 projects in Miami-Dade, Broward and Palm Beach counties. “As a government run regional center, we are – and should be – held to a higher standard of transparency and compliance,” Ms. Canton said. The planned Miami Marine Stadium renovation is to be partially funded using EB-5 money through the locally run regional center. “The marine stadium is a perfect project because it’s an iconic jewel that defines our community and it will create a great deal of jobs in restoration and management,” Ms. Canton said. As for future EB-5 projects, Mr. Montero said his team is active with several hospitality and restaurant related projects. Ms. Canton said her team has been moving forward with the proposed Miami Veterans’ Village project and is looking at a number of new infrastructure programs. “We’re excited about affordable housing and new multigenerational concepts that can bring together people from all walks of life,” Ms. Canton said. Land purchasing does not create jobs, therefore it does not fall under EB-5 category. Cancel EB5. It brings the worst of the worst. EB5 invites those of affluence most willing to consume the resources of their nation without contriburing to its growth and development. In biology they are called parasites. We have enough of that already. Advantage of EB-5 direct investment versus regional centre. The annual returns are a lot higher. Regional centres typically give annual returns of .25% to 1% per year, while we offer an annual dividend of 5% from operating profits. The investment amount is USD 550,000 and the fees are USD 75,000. Moreover, we offer written guarantee of zero conflict of interest and full disclosure of material facts, while regional centre CEOs will NEVER offer this guarantee. We also offer a full fee refund guarantee if the investor is denied due to our fault or negligence, while regional centres will never offer this guarantee. The approval for the direct investment category petitions is a lot faster than the regional center petitions. Advantage of EB-1 category visas versus regional centre. The EB-1 program is for business owners, and if someone isn’t a business owner, we can help arrange for a qualifying business. The annual returns are a lot higher. Regional centres typically give annual returns of .25% to 1% per year, while we offer an annual dividend of 5% from operating profits. The investment amount is USD 550,000 and the fees are USD 75,000. The approval for the EB-1 Visa petitions is a lot faster than the regional center petitions. In EB-5 Visa category, it takes about 2.5 years to get the temporary green card and over 6 years to get the permanent green card, while it takes about 2 years to get the permanent green card under the EB-1 category. The capital lock in period for EB-5 Visa investors is 7-9 years, while the capital lock in period for EB-1 category is typically 5 years. Be careful reading any comments promising EB-5 projects with guaranteed returns. Those are automatically disqualified by USCIS. Conduct due diligence before investing. 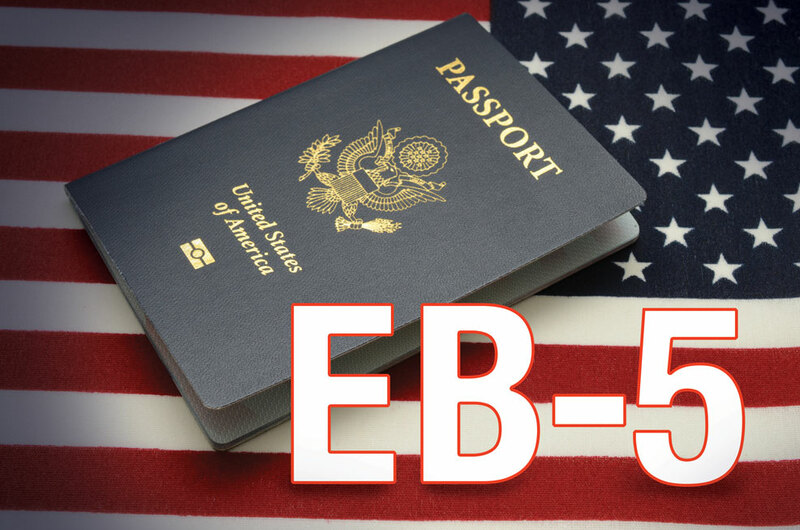 The EB-5 Program benefits the U.S. in many ways. It stimulates the economy by giving developers alternative avenues for funding large projects, it helps high unemployment areas, and it creates hundreds of thousands of jobs.